The state’s unprecedented cuts to benefits for the jobless are leaving families stranded without money for food, transportation and housing. 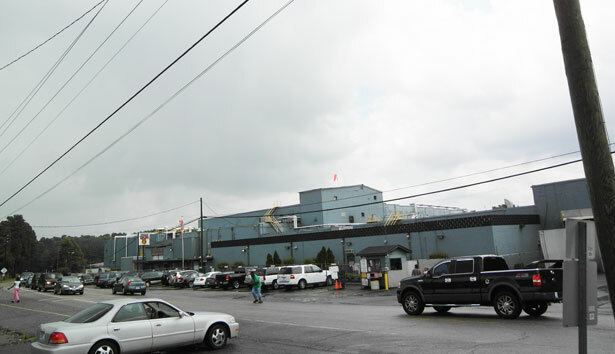 The House of Raeford turkey processing plant in Raeford, North Carolina. Credit: Spencer Woodman/The Nation. Maxton, North Carolina—On a sweltering morning in early August, Lester Dixon packed a U-Haul truck tightly with his family’s possessions, which would soon set off for a nearby storage facility. No longer able to afford rent on their four-bedroom home, the family would disperse later that day to stay with friends and relatives until a cheaper dwelling became available. Resting his elbows on the lid of an industrial-size plastic garbage bin, Dixon pointed to one thing he’d be holding onto: a regional phonebook he used daily to call warehouses, factories and retail stores across the state that might hire him as a forklift driver. On July 1, Dixon, along with over 70,000 other North Carolinians, lost his unemployment benefits in an unprecedented cut to state aid for the jobless. By voting to slash its unemployment insurance program last February, the state violated federal guidelines, causing it to become the first state ineligible for federal jobless aid. Over the next few months, an additional 100,000 job seekers in the state, who would have otherwise qualified, will lose benefits. State Republicans argue that the cuts, designed and lobbied for by the North Carolina Chamber of Commerce, will keep the state’s business taxes within reason while its government repays a massive debt owed to the federal government for its post-recession unemployment program. At 8.8 percent, North Carolina’s unemployment rate is the fifth highest in the nation, and some of its most extreme joblessness is focused in rural counties along its eastern and western flanks. Dixon’s town of Maxton, on the state’s southern edge, divides between Scotland and Robeson counties, which reported June unemployment rates of 16.2 percent and 13 percent respectively. Advocates worry that people and organizations in such areas could bear a particularly harsh impact of the benefit reduction. Sitting in his cavernous office inside Raeford’s decommissioned train depot, Porter explained that jobs are still fast disappearing from the region. Later that week, his town of 4,600 would lose almost a thousand jobs in the closure of a massive turkey processing facility called the House of Raeford. For decades, the plant had been a keystone of the town’s private sector economy. Porter worries most for workers old enough to face challenges updating their skill-sets, but who also must continue to earn a living. The workers cast off by the House of Raeford closure will “become the first large-scale test” of North Carolina’s novel approach to unemployment insurance, according to Sarah Ovaska, an investigative reporter at NC Policy Watch, a think tank associated with the NC Justice Center. As a consequence of dramatically scaled back benefits, the newly unemployed can expect to see civil society organizations straining to meet a new level of need. The benefit changes entail a reduction in both duration and size of benefits, from $535 a week to $350. The reduction in the weekly amount brings the state in line with most throughout the South, yet the cuts to duration—July 1 marking an immediate shift from the state’s offering sixty-three weeks of combined state and federal unemployment aid to as few as twelve weeks depending on the state’s unemployment rate—makes North Carolina a national outlier. According to the most recent available USDA data, over 17 percent of North Carolina’s families faced a low level of food security in 2011—placing the state’s hunger rate at sixth highest in the nation. One of the South’s fastest-growing economies, North Carolina is regarded as a role model for development. For three decades, the state has attracted huge numbers of high-skilled jobs to cities in its central Piedmont region such as Raleigh-Durham, where Fulbright Scholars, specialty surgeons and French fusion chefs have helped to give the area a claim on cosmopolitan competitiveness. “There are a lot of parts to our economic miracle that are very real,” Nichol said, “But the state has developed unevenly. While we’ve spent a lot of time and money recruiting high-tech jobs to its big cities, a lot of people have been left out.” Like many other states, North Carolina’s poverty rate distributes differently between racial groups. Fourteen percent of whites in the state face persistent poverty, but that number more than doubles for African-Americans and other minorities. The state’s premier libertarian think tank, the John Locke Foundation, has vigorously argued that because unemployment insurance provides temporary income, it discourages the unemployed from looking for work and is therefore partly to blame for the state’s high unemployment rate. “No economy ever grew more healthy and productive by paying employable adults not to take jobs,” wrote John Locke President John Hood earlier this year. The state’s billionaire retail magnate, Art Pope, largely funds the John Locke Foundation and its sister think tank, the Civitas Institute, which Pope founded. A 2011 New Yorker profile of Pope outlined how the activist financier might—especially in the wake of the Supreme Court’s Citizens United decision—single-handedly shift rightward the state’s political landscape. This year, for the first time since Reconstruction, Republicans took control of both the state’s legislature and the governorship. The new governor, Pat McCrory, installed Art Pope as co-chair of his transition team. Republicans quickly launched a bitterly polarizing yet comprehensively successful push to legislate some of the country’s most sweepingly conservative state policies, including deep cuts to public education, tight regulations on abortion clinics, and one of the nation’s strictest voter laws. In seven months, despite the arrest of hundreds of Moral Monday protesters led by the charismatic Reverend William Barber, North Carolina reversed many policies that had made the state among the South’s most moderate. The state’s change to jobless aid is one among many worries for rural poverty advocates. The state’s recent decision to opt out of the federal Medicaid expansion will exclude some 500,000 low-income North Carolinians from subsidized health insurance. The new government also initiated deep cuts to funding for the NC Rural Center, a nonprofit dogged by allegations of rampant cronyism and inefficiency, but one of the only statewide organization that focuses on development of poor areas of the countryside. “Even starting in kindergarten through twelfth grade,” said Legerton, “kids look around and think, ‘Why would I want to finish high school, when there are no jobs out there?’ ” Legerton traces much of Robeson County’s ills (it’s one of the poorest and most violent areas in the state) to the outsourcing of jobs that once held together a social fabric of stable homes and gave residents confidence to invest in their futures. Three years ago, Dixon found a job doing maintenance and driving a forklift at a factory in Raeford, twenty-five miles north of Maxton. “I got that job and—bam!—I was making the big bucks, fourteen dollars an hour.” Last year, Dixon was laid off and, last March, began collecting unemployment insurance. Dixon said that affording adequate meals for his family has become difficult. In another battle, North Carolinians are challenging a recently-passed voter suppresion law, the strictest in the country. Spencer WoodmanSpencer Woodman is a freelance writer based in New York. You can reach him at spencerwoodman@gmail.com or follow him on Twitter via @spencerwoodman.